This article appeared in South American Explorer, Edition No. 89, Winter 2009. The ancient necropolis of Otuzco stills stands majestic, bearing testimony to the past grandeur of the people of Cajamarca, a valley nested in the highlands of northern Peru. The date of its construction is uncertain; some ceramic pieces have been dated to 1400 B.C. 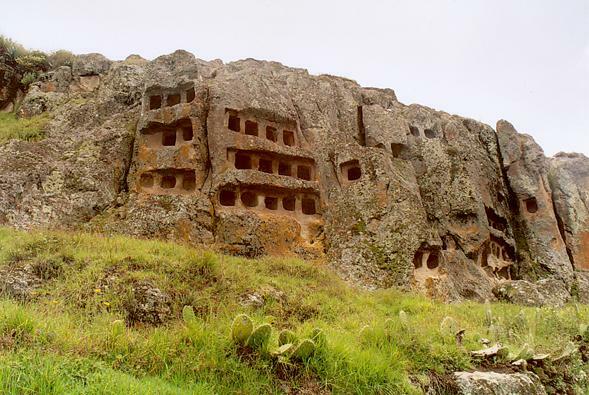 It was a vast necropolis, carved out of the surrounding rocky hill, painstakingly and with amazing precision, to house the remains of the dead of Cajamarca. 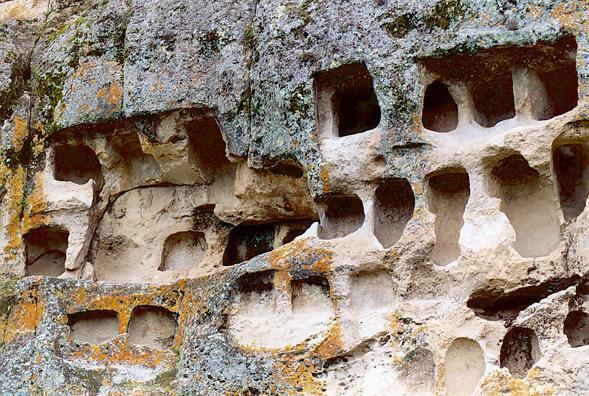 The "Ventanillas (Small Windows) of Otuzco" are indeed a remarkable monument. Very little is known about this curious archaeological wonder or about its builders, the Cajamarcas, who used it over a period of over 2,000 years. The Cajamarcas preceded the Incas, who moved into the valley around 1240 A.D. Atahualpa, the last Inca, was at the Royal Baths of Cajamarca, within a few miles of Otuzco, when the Conquistador Francisco Pizarro arrived in the year 1532 to conquer the Inca Empire. Archaeological evidence suggests the presence of an autonomous culture in the region of Cajamarca around the years 200 to 300 A.D. This culture flourished until its conquest by the Incas, around 1240 A.D. 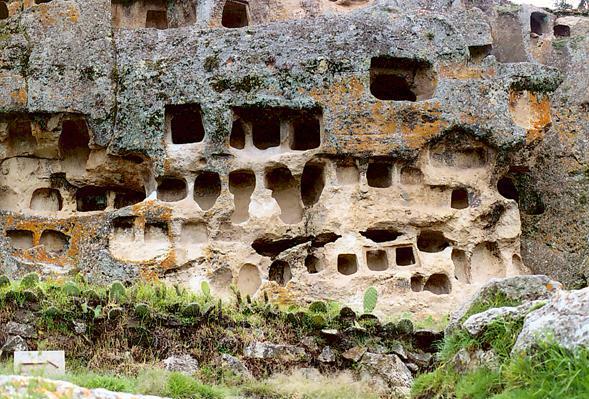 The local inhabitants of Cajamarca spoke a language called "Culle," of which a few traces remain. For instance, Su is "sun," Muñ is "moon," Chuip is "Stars," vru is "tree," chucuall is "heart," cañi is "sister," and quiñú is "father." The Cajamarcas worshipped Catequil, the god of lightning and thunder, and also, Su, Muñ and Chuip. The Cajamarcas were predominantly an agricultural people. They grew maize, beans, and a type of green pea, mostly on the hillslopes. They built their cities and towns not in the valleys, but rather on the hilltops or other strategic locations, where they could better defend themselves against their enemies. The early conquistadors told of great buildings, most of which are now gone. Early ceramic pieces of Cajamarca date back to 1400 B.C. The pieces are particularly well made, with significant decorations and deep incisions. The use of kaolin came later, and led to finely textured ceramics, many with zoomorphic motives (serpents, cats, and toads) and human renderings. The predominant colors were black, brown, and orange. The town of Otuzco is located northeast of the city of Cajamarca, at a distance of 7.5 km (4.7 miles), along the road to Combayo. It has a population of about 1,500 inhabitants. Its main economic activities are agriculture, animal husbandry, and the production of woven mats. 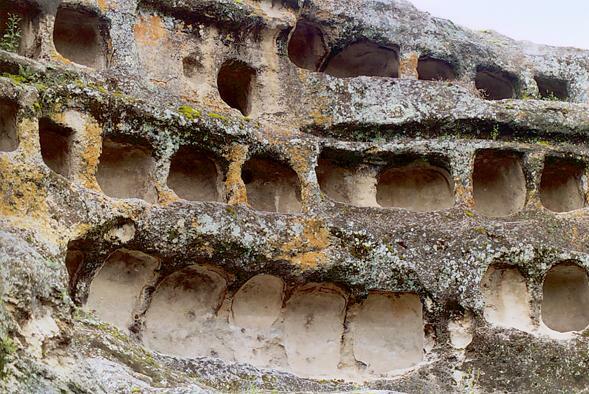 The "Ventanillas of Otuzco" is one of the better preserved archaeological sites in the region. The word "Otushco" or "Otuzco" originates in "oto" which means "eaten by moths," in reference to the shape and look of the small windows. It is located at 7o7'24'' southern latitude and 78o27'18'' western longitude, at an elevation of 2,850 meters (9,350 ft) above mean sea level, and it occupies an area of 1,700 square meters (0.37 acres). The climate is temperate and the rainy season lasts from December to March. The predominantly igneous rocks in the vicinity of Otuzco suited the Cajamarcas, who chiseled out the small windows from the rock. With time, the progressive weathering of the rock gave the monument its characteristic, worn-out appearance. 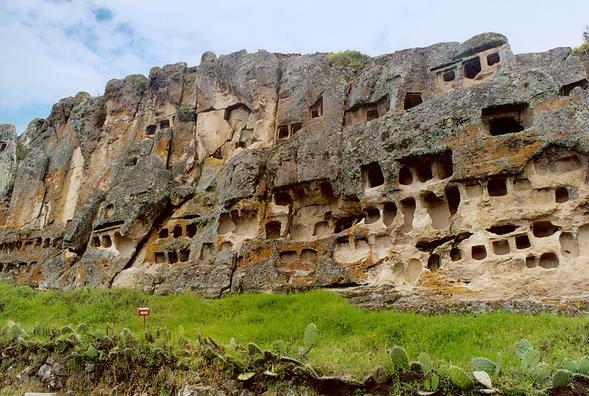 There are a total of 337 niches in Otuzco, most of them nearly square to rectangular in shape, with measurements varying from 0.22 to 0.6 meters (0.7 to 2 feet) wide and 0.3 to 0.75 meters (1 to 2.5 feet) high. The internal walls are smooth and flat. The simple niches have direct access; the multiple niches have indirect access, with a central corridor and rows of smaller niches on both sides. Simple niches have an upper ledge, which protects the external walls from the inclemency of the weather. Despite the constant depredation from humans and other creatures, the monument has retained its significance as an important funerary building, or necropolis, in fact a "City of the Dead." In Andean thought, death amounted to a continuation of life; therefore, utensils, food, and other offerings were assembled in the funerary niche. The ceramics found on the site have been dated to the following periods: Late Huacaloma, and Early, Medium, and Late Cajamarca. These periods span the years 1130 B.C. to 1240 A.D., bearing witness to nearly 2,400 years of settlement. Other monuments similar in shape and meaning to the Ventanillas of Otuzco are scattered throughout Cajamarca along the basins of the Chonta and Llaucán rivers. Worthy of mention are the Ventanillas of Bellavista and Corisorgona in the province of Hualgayoc; Combayo and Cerro Consejo in Cajamarca proper; Catán and Tolón in Contumazá; Chacapampa in San Pablo; Jangalá in San Miguel; and San Marcos in San Marcos. Similar ventanilla-style necropolis are also found in the neighboring Peruvian departments of La Libertad (Cerro Wallio, in Santiago de Chuco) and Amazonas (in Luya province). How to reach Cajamarca and Otuzco. Fly nonstop to Lima, Peru, from one of several cities in the United States, including Los Angeles, Dallas/Forth Worth, Houston, and Miami; the flight time is about 6-8 hours. The nonstop flight from Lima to the northern city of Chiclayo takes a little more than an hour; the bus ride is about 10 hours. From Chiclayo, it is a 5-hour ride by car or bus to Cajamarca, by paved road. From Cajamarca, hire a taxi or find alternate transportation to the site, which is located about 8 kilometers (5 miles) from the center of town in the northeastern direction, about half-way along the road to Combayo.